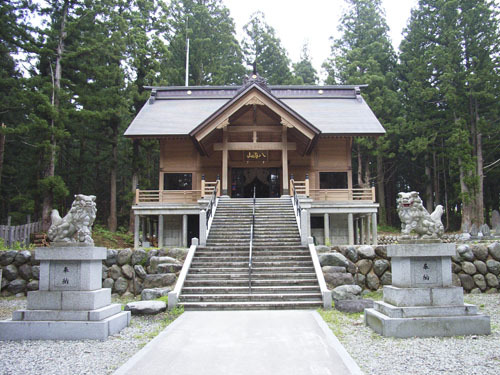 Founded over 1200 years ago, this temple has a long history; itinerant priests of mountain worship came to this temple to lead an ascetic life, small shrines to fieldstones were created, a Japanese cedar became a sacred tree and was worshiped, and there was an avenue of cedars 440 m long that approached the temple from both sides. Every year in the beginning of the summer, at the event for the start of the mountain-climbing season, there is a fire-walking festival where participants walk through a fire with bare feet. Get on Joetsu Line or Hoku-Hoku Line from Echigo-Yuzawa Station, and get off at Muikamachi Station. Change to Mt. Hakkai Ski Resort Line buses for 23 minutes and get off at 中手原 . About 4 minutes walk from there.